Christmas has come and gone for another year. 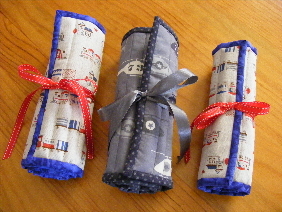 Thought I would pop back and show you some of the little things I made for presents. 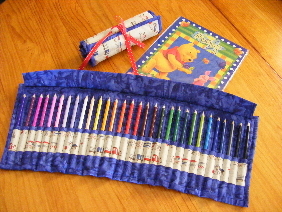 Firstly their were my nephews pencil rolls. 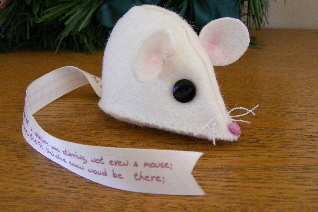 Then this cute little mouse was made as part of a challenge to make something using the piece of ribbon I used for it’s tail. The ribbon had “T’was the night before Christmas……” on it. I may now have some plans for this little mouse in the future. It was very hard to part with it. 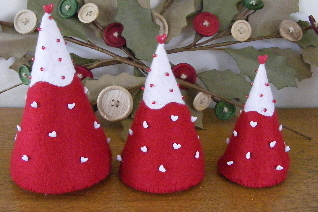 Then I also made some table centre pieces of a set of 3 Christmas trees. I placed them on a tray and surrounded them with Lindt balls. They were loved by their recipients. I have since been busy finishing off a project for Creating Country Threads which you will have to wait until May to see – sorry! I hope that you all had a lovely Christmas with family. While this year has started off lovely for some our Queensland friends are struggling through the most awful floods on record. Our hearts are torn as we view the devastation on our television screens. It is hard to imagine what they must be going through. Our thoughts and prayers are with them at this time. There are quite a few crafters organising fundraising to assist with the aftermath. One of them is Toni Coward from Make It Perfect who is assisting bloggers to organise auctions with the funds being fully donated to the Flood Appeal. Visit her blog for a list of auctions that will be taking place on others blogs. The Gum Tree Designers are also organising for people to donate sewing kits, so visit their blog to see how you can assist. Every little bit that we do can help. I wish you all safe keeping over the coming months.